Lua, a line of naturally handmade scarves, was founded by Dat Tran and Pat Gough of California, while they were exploring the remote countryside of the Far East. They happened upon a small community where artisans created beautiful and exotic textiles using traditional silk harvesting methods and weaving techniques. The silk is spun using traditional spindles and then dyed with meticulous hand dyeing methods in small batches. Dat and Pat formed a partnership where their designs, inspired by their travels, are created by silk farmers and skilled artisans. Through the partnership, the farmers and artisans are provided a sustainable livelihood and the opportunity to continue creating using their centurys old craft. We invite you to visit Cameron’s and witness their beautiful creations. The silk is light and easy to wear all year long. The patterns come in an array of swirling color combinations. You are sure to find the perfect scarf for your wardrobe! So it ‘s that time of year again when Elaine shares all her wonderful images of North Carolina in the way only she can do. Elaine moved to North Carolina twenty two years ago and to this day, is still dazzled by the places she has discovered. This dazzle is clear in her images. Though her poster calendars are filled with images of places we have all visited, her sense of whimsy create a magic that is new and real. Her story begins in rural Maine. She was born the great granddaughter of a lighthouse keeper, a granddaughter to a framer and the daughter to a home economics teacher and ardent seamstress. She began sewing at an early age and eventually became the textile collage artist she is today. 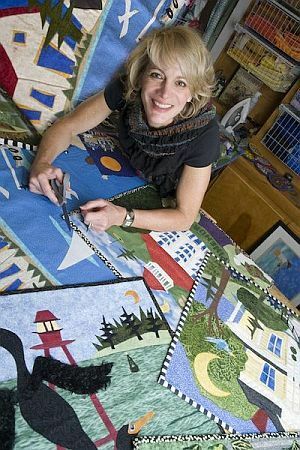 She received a degree in textile design from the Philadelphia College of Textiles and Science, and has shown her work in galleries up and down the East Coast as well as in the mountains of North Carolina. She has been commissioned to do work which now lives in Russia, England, Greece, Italy and France. Once she has created a piece, she then has it professionally photographed. Through this process, her images are accessible to a larger audience as they are reproduced as cards, prints and calendars. The idea of a calendar came about as Elaine longed for a partnership. She had created a piece of art to hang in UNC’s Mammography client in honor of a friend lost to cancer. Soon she was collaborating with doctors at the UNC Cancer hospital. Through this partnership, Elaine now shares a portion of the proceeds from the calendars with the UNC Cancer hospital. This is the ninth year Elaine has created the calendar and truly, every year it gets better and better. Join us for our Second Friday ArtWalk in August to see her new calendar. For this weekend, all poster calendars will be 15% off! On July 6-7 2018, Cameron’s hosted a Fair Trade Festival, featuring three of our fair trade lines. We will have enhanced inventory from World Finds, Global Mamas and Maggie’s Organics. Therefore, in the month of July, rather than focus on an individual artist, we focused on what it means to be Fair Trade Certified. The Fair Trade industry reminds us that the products we sell and buy are directly connected to the livelihood of others. The Fair Trade industry insists on higher standards for farmers, workers and fishermen. In order for a company to be considered Fair Trade certified, it must adhere to the following four commitments. First, the income paid to workers must fulfill basic household needs. Beyond that, workers must be paid enough to then have additional funds to invest in their lives and work. In many cases, workers are able to start their own businesses. Second, the work must lead to empowerment. Fair trade workers must be empowered to make choices for themselves and ultimately make choices that are for the good of their community. This empowerment must be regardless of gender, status in the community or position on the globe. Third, the fair trade workers must be charged with how to invest the revenues generated through their businesses. When companies are committed to Fair Trade, they are creating a pathway for low income artisans to be helped out of poverty. Part of their commitment involves investing in community development funds. For every product sold, the business pays an additional amount into a fund which goes directly back to the community of origin. Depending on the community, the investment could be used in the attainment of cleaner water for their community, a strengthening of the education system or greater access to healthcare. And finally, the fair trade community is committed to keeping the planet healthy for future generations. The use of harmful chemicals is prohibited and there must be a concerted effort to protect natural resources. This was an opportunity to continue to share the unique stories of these three Fair Trade companies. Though Maruca is now a women owned and run business, the birth of the company occurred when Rex Maruca, who sold fabric for the upholstery industry, crafted a bag to carry his swatches. And thus, the studio nestled in the foothills of Boulder, was born. Maruca finds their inspiration in the founding principles of the Arts and Crafts movement that took place in America from 1860-1910. The movement embraced the value placed on traditional and decorative craftsmanship using simple design. The movement was opposed to industrial manufacturing and strove to promote the moral, social and economic health of the nation. These values are still so relevant in the 21st century as we as consumers are faced with so many choices from fast fashion to a more slow, hand crafted option. Here, at Cameron’s, we are happy to offer an item that celebrates craftsmanship and the process of creating with love and intention. Every season, Maruca presents similar shapes but with new invented fabrics. The designers at Maruca had taken great care to listen to their customers and design shapes that are “Funk-tional”. The designs have true style but are also made to be used and appreciated. The fabric is Jacquard which means intricately woven pattern using a special loom in the weaving process. Though the business is rooted in the philosophy of American Made, the patterns of the fabric are inspired from global trends from the beautiful ikats of India to the bold, colorful patterns of Africa. Maruca collaborates with talented textile designers from various small independent U.S. fabric mills. The fabric can vary from cottons to rayons to synthetics-many of which are from recycled plastic. And thus, twice a year, Maruca presents a new palette of colors and designs in shapes that are trusted and familiar. With their success in business, Maruca is able to give back to several local and national non-profits. These include, I have a dream, Boulder Valley Women’s Health, Children’s Diabetes Foundation, Boulder County Aids Project, Freedom Service Dogs, Community Food Share and Attention Home. When I read this statement, I knew I had found my artist for May! Every second Sunday in May we celebrate our mothers and many of our customers choose to thank their Moms with a jewelry purchase from Cameron’s. I cannot express how much I enjoy watching children, often with their fathers, pick out jewelry for their Moms. For the children, the search is truly a treasure hunt and a delight to find a bit of beauty to give in thanks. We all are attracted to color and so naturally many customers find themselves pondering the many designs of Holly Yashi, a beautiful and unique line that has stood the test of time. Though every year they introduce new designs, they never deviate from their signature look using colorful, lightweight and easy to care for Niobium. Woven into their designs are materials such as Swarovski crystals, dichroic glass and hypo allergenic metals. Their story begins in 1981 in a small garage studio. Holly Hosterman had completed a degree in Studio Art with an emphasis in Jewelry. Paul “Yashi” Lubitz held a double degree in industrial technology and music. Together, they discovered the magic of Niobium. Niobium, a dull gray metal, is transformed through an expedited oxidation process in which it is dipped into a bath of electrically charged water. Through this process, the metal changes into rich hues of color. Thus, their signature look was born and not unlike the transformation of Niobium, flash forward to today and their small garage studio is now a 15,000 square foot studio in Arcata, California, nestled between the Redwood Forest and the Pacific coastline. Through the years, they have stayed committed to creating jewelry in small batches, taking the time needed to create a treasure. Though they recognize that much of the jewelry industry is focused on producing jewelry quickly and inexpensively, without a long life expectancy, they choose to labor longer, with love, and create a jewel that will last. With the success of their studio, Holly Yashi has been able to set up a fund, Holly Yashi Cares. Holly Hosterman, herself, suffered through a rare form of breast cancer. During her struggle, she discovered the Dr. Susan Love Research Foundation.